It’s not a secret that modern smartphone market is occupied mostly by two digital giants, Samsung and Apple. But even they have to continue researching in order to keep users interested in their production (not speaking about smaller companies). During recent years mobile manufacturers have tried to amaze their potential users with different innovations in the form of unusual bodies and functional parts of mobile devices. As an example we can remember flexible displays, whole flexible devices, transparent LCD monitors and other features. 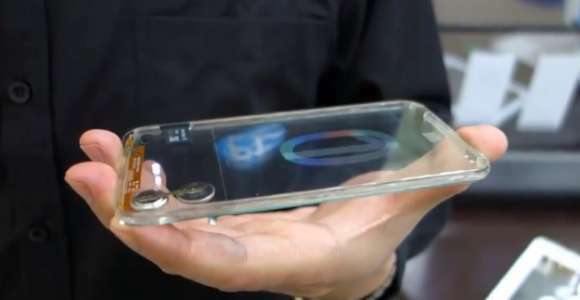 And one of the most interesting recent innovations is a transparent mobile device presented recently by the representatives of a Taiwanese company called Polytron Technologies. The prototype of a transparent mobile device presented by Polytron can’t boast of high definition or of large screen. And in fact, only part of the device is completely transparent through which you can see some of the inner hardware of the device (like electronic circuit board, memory card, and batteries in the form of slim round tablets). The functioning of the prototype device is based on the so-called “Smart Glass” technology which becomes non-transparent when control switch is output from the device. But when the device is turned on you can see the surrounding quite clearly through it. At the moment, a prototype model has a quite limited number of functions due to slow software and complete absence of some functional parts within the device. It’s also worth noting that the advantages of transparent displays and transparent mobile devices are under discussion. The capability to see irrelevant images as a background to the images displayed on the monitor is most likely to have negative impact on the quality and intelligibility of the images on the monitor of the device. Apart from that, background images may distract a user from working with the device. I’m not sure where people would like to work on such a gadget. Nevertheless, such technologies have great potential in other spheres of our life. Thus, they may be applied as smart windshields in cars, smart shop windows, etc., that is in the situations when the capability to see through a glass is a real necessity. 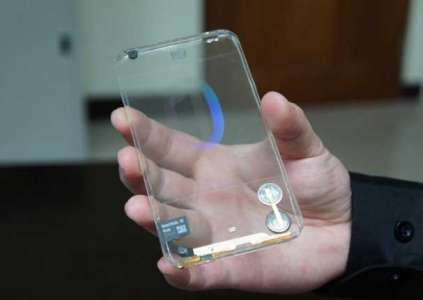 According to Polytron representatives, first transparent smartphones will hit the market at the end of 2013, but it’s still unclear when the mass production of such devices will begin. Eugene Rudenko is a copywriter for IT company Intellectsoft. Intellectsoft is a world-known mobile app developer and is a preferred Apple (UK) supplier. Hi Eugene, thanks for the article. I especially liked the fact that you gave us a preview with the images you posted as well. I enjoy reading about experimental technology. Best Regards.